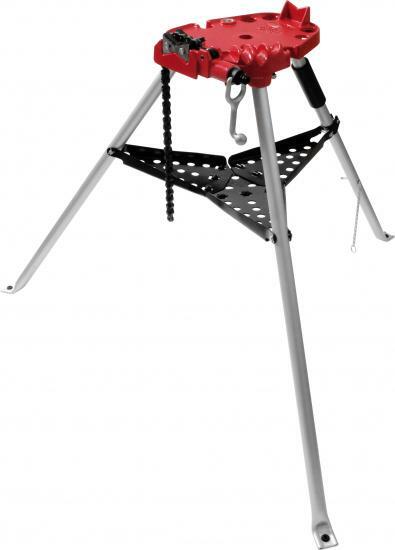 Aluminum legs reduce tripod vise weight, making R450PAL a great choice for weight-critical field use. At under 28 pounds, R450PAL is about 30% lighter than competitive models. Patented, reversible double-sided bowtie jaws with neoprene side for plastic pipe and steel jaws on other side for metal pipe. Chain vise style adjusts to odd-shaped work pieces. Handle grip is positioned for handler to pick up and carry the folded tripod at the balance point. Sides on folding tray keep tools and parts safe from falling or rolling off.